There are tons of ways to make money online, and you don’t have to commit hours and hours every week in order to make a side income. In fact, there are plenty of ways to get paid online for the things you’re already doing every day. From shopping and browsing the web to playing games and watching videos, why not get free money online for the things you’re already doing? 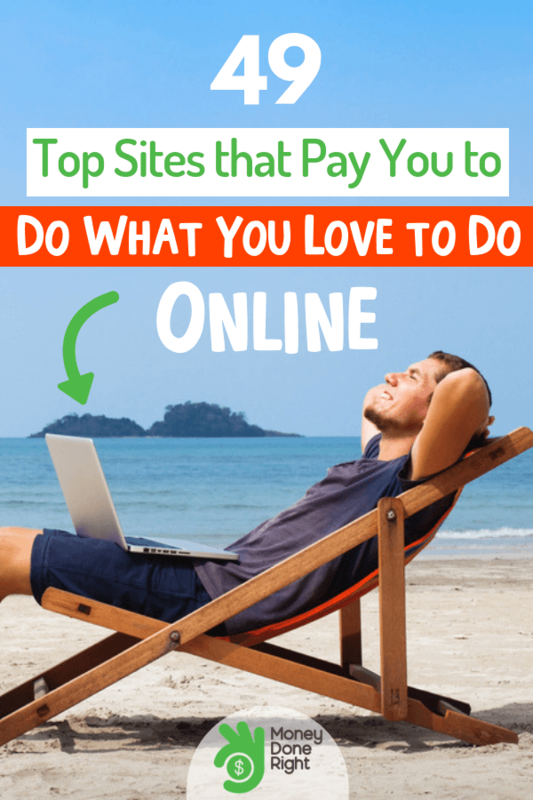 Here are 49 of the top sites that pay you money for the things you love to do online every day. With so many paid survey sites available, it’s easy to make significant earnings by completing surveys online. If you like reviewing products or services, why not get paid for your opinions by signing up for one of these top survey sites? Survey Junkie is one of the largest survey sites in the world, with over three million users to date. Sign up for Survey Junkie and get matched with lucrative surveys and other fun activities based on your interests and shopping trends. When you complete surveys, you’ll earn points that can be converted into gift cards or cash sent straight to your PayPal account. Click here to start making money by sharing your opinions on Survey Junkie! Ipsos i-Say is another top survey site that pays well for completed surveys. Partnering with companies around the world, you’ll be paid for your opinion on products and services from leading companies such as Amazon, Walmart, and Nike. Use your points in the digital store and earn additional prizes on select surveys. You’ll even earn free entries into drawings where you can win even more points, cash, and trips to your favorite destinations. For another great way to make free money online, sign up for Ipsos i-Say today! If you want to earn even more for your opinions on the products and services you use every day, consider signing up for Swagbucks. Swagbucks has paid its users over $200 million to date, making it one of the largest paid survey sites in the world. With hundreds of surveys and activities uploaded every day, Swagbucks is one of the easiest ways to earn money online for the things you already do. Redeem your points for cash and gift cards in increments as low as $1, making it very easy to cash out your earnings. Inbox Dollars sends targeted emails with surveys that match to your specific consumer profile. That means you’ll be sent surveys directly rather than searching for surveys on the site. In addition to surveys, you can play games and complete other fun activities to earn cash right in your Inbox Dollars account. Earn even more by signing up for Inbox Dollars. Vindale Research is a top consumer research firm that pays users like you to complete surveys on the products and services you love. You can complete surveys, take part in focus groups, and provide your valuable opinion to top companies around the world. Vindale Research also has one of the highest payouts in the paid survey industry, making it a must-have on your list of paid survey site accounts. Click here to sign up for Vindale Research and start getting paid for your opinion. Get tailored survey results with high payouts through Global Test Market. With a traditional point system, the point-to-cash conversions are significantly higher on Global Test Market than many other survey sites. Some surveys offer hundreds of points upon completion. Use your points to redeem gift cards, merchandise, or cash payouts. Check out Global Test Market and sign up today. The final survey site on our list is Pinecone Research, an exclusive, invite-only site that offers targeted surveys and high payouts. Due to its exclusivity, you don’t have to compete with other users to complete surveys and earn money, making it an excellent option if you can get an invite. Want to earn even more free money online through survey sites? Click here to find out how. You read that right, you can now make money playing games online. If you love playing games online, check out these sites to get paid for the games you play. Gamesville is one of the leading sites that pay users to play games, offering hundreds of fun games to choose from. When you play games, you’ll earn GV Coins, which you can use to purchase gift cards in the digital store. Games include bingo, poker, and solitaire to name a few. Get paid for the games you play by signing up for Gamesville. With free games and the chance to win prizes such as gift cards and cash drawings, GSN Cash is another fantastic site that will pay you to play games online. Each game has different prize payouts, and many of the games have tournaments and competitions where you can win big. Play casino games, game show games, word games, and more, all while getting paid on GSN Cash. When you sign up for Long Game Savings, you’ll not only earn money by playing fun games, but you’ll also learn effective financial strategies to help save for your future. Create a custom savings goal through your Long Game Savings dashboard. When you reach that goal, you’ll unlock games to play that reward you with cash and other prizes. Conquer your finances and get paid to play games by signing up for Long Game Savings. Test your luck with Lucky Day, a free app that lets you scratch off digital lottery tickets to earn points and cash prizes. Rather than buying a lottery ticket, Lucky Day is funded by advertisements. That means you can scratch the digital tickets for free and potentially win cash. Start scratching your free lottery tickets with Lucky Day. Virtually everyone shops online, so why not get free money online for the shopping you’re already doing? Here are some top sites that give you free money to shop. As one of the largest cashback sites in the world, Ebates has transformed the way that consumers shop online. When you create your account, you can browse the countless cash back offers on the site and select the one you want to use. Simply shop on the retailer’s site after clicking your offer and your cash back will be loaded into your Ebates account automatically. Sign up for Ebates through this link and start getting cash back on all of your online purchases. Best Mark offers its users thousands of mystery shopping assignments every month, making it a great way to make money by doing the shopping you already do. Signing up as a mystery shopper takes just a few minutes, and you’ll be linked to countless assignments in your area. There are many mystery shopping scams out there, but we’ve fully vetted Best Mark and trust it as a leading mystery shopper service provider. Get paid to shop at your favorite stores as a mystery shopper with Best Mark. You can also be paid to be a mystery shopper online through Mystery Shoppers. If you love online shopping, sign up for Mystery Shoppers to get paid to shop without leaving your home. You’ll be linked to tailored assignments and can give valuable feedback on your experience. Shop online and get paid as a mystery shopper through Mystery Shoppers. Ibotta allows you to earn exclusive cash back offers on your purchases online and in-stores. Simply scan your receipt, link your loyalty program account, or shop right in the Ibotta app to earn your cash back. You can withdraw your cash back through PayPal or Venmo, making it easier than ever to get cash back on your purchases. Sign up for Ibotta today to start getting cash back on all of your shopping! Most retailers have a price-protection policy that allows consumers to get cash back on purchases when the price drops within a specific time period after the purchase. Paribus monitors your purchases and helps to get you a refund when it detects a price drop. Get cash back at hundreds of your favorite stores by signing up for a free ShopAtHome account today. Signing up takes just a few minutes and you’ll be able to start browsing the exclusive cash back offers on your ShopAtHome dashboard. You’ll even be linked to local deals that you can use in your area every time you shop. Get more cash back on the things you buy every day by signing up for ShopAtHome. We spend a lot of time online, and there are a few sites out there that will pay you for simply browsing the internet. Check out these top sites that pay you for browsing the web. As one of the largest search engines available today, Bing also offers users rewards for using the site, meaning you can earn rewards by simply completing a search online. When you sign up for Bing Rewards, you agree to let Bing analyze your search information for marketing and research purposes. In return, you can earn reward points that you can redeem for fun prizes. Sign up for Bing Rewards to get paid when you browse the internet. Scour is an app that rewards users for discovering new apps, watching videos, and browsing the web. Simply download the Scour app and complete fun activities. You’ll see new activities uploaded almost every day, making it an easy way to earn some extra cash on the site. Download Scour to your phone and earn money on the things you do online every day. Grabpoints, formerly Zoombucks, rewards users for their internet traffic data, as well as for completing tasks such as surveys, watching videos, and answering polls. After rebranding to Grabpoints, the site added dozens of additional gift card options and countless ways to earn points. This makes it a great option if you’re looking to earn money in your spare time. Check out the offers on Grabpoints today. Driving is a very simple way to earn significant money for something you probably do every day. Whether you want to drive people or deliver on behalf of businesses, here are some sites you should check out. While earnings on Uber can vary, you very well could earn $25 or more per hour driving with Uber depending on your market. With the recent addition of the tip function in the app, there’s never been a better time to start driving for Uber. Sign up for Uber today to start making money driving. Most people that drive for Uber also drive for Lyft, and it makes sense why. By driving for the two largest rideshare companies in the world, you’ll be able to connect with more riders and earn even more money. You can pick and choose your schedule, making Lyft one of the most flexible ways to make money on the side. Click here to start earning money with Lyft today. Don’t want to drive people around? Deliver food with Uber Eats instead. You’ll be able to deliver food to homes and businesses and keep all of your delivery tips. Uber Eats partners with more restaurants every day, meaning there are always deliveries available in the app. Make some extra money delivering food by signing up for Uber Eats today. The holiday season is the perfect time to sign up for Amazon Flex. When you sign up for Amazon Flex, you’ll be paid to make deliveries to homes and businesses on behalf of Amazon. Take on deliveries in your area and drive when you want. Why not get paid to drive your car? Sign up for Amazon Flex to get started. If you love teaching, there’s a vast market for skilled tutors online. Here are some of the top paying tutor sites that you should check out today. Sign up to teach English on VIPKid and earn up to $20 or more per hour from the comfort of your own home. When you sign up, you’ll simply need to complete a questionnaire and mock interview. If you have a passion for teaching, sign up for VIPKid to turn that passion into additional income. For more generalized tutoring opportunities, check out Tutor.com. The site is the world’s top tutoring platform and allows tutors to assist students in a wide range of fun topics. You’ll need to pass a subject exam before you start tutoring, but once you’re accepted you can set your hours and specific tutoring rate. Check out Tutor.com to earn additional income teaching students around the world. Rather than working one on one with students in a chat or video environment, Studypool pays you for answering questions submitted by students. You can browse questions and be matched with students based on your skills and expertise, meaning you get paid for simply sharing your knowledge. Answer questions and get paid for your knowledge with Studypool. While data entry can involve reviewing data on spreadsheets, it also encompasses other fields of online work. Here are some of the top data entry sites that you can use to earn some free money online. Quicktate is actually a transcription service that pays users to transcribe audio files. Files range from just a few seconds to multiple hours long, and you’ll be paid competitive per-audio hour rates. Signing up takes just a few minutes, and you’ll be linked with thousands of transcription jobs that you can apply for. Click here to learn more about transcription and to sign up for Quicktate today. Clickworker is a micro-job site that allows you to earn money for small tasks and projects. Some of these tasks are data entry related, but others include creative skills such as photo editing or web design. Pay rates vary by project, with the most common job being simple web research. Pick up paying projects by signing up for Clickworker. Similar to Clickworker, Amazon Mechanical Turk is used by thousands of businesses around the world to complete small tasks, including research, data entry, and analysis. The tasks times range from just a few seconds to multiple hours, and the pay ranges vary accordingly. You’ll get to research interesting topics, learn about new industries and businesses, and connect with companies all over the world, all while being paid. Click here to get started with Amazon Mechanical Turk. Connect to even more micro-tasks through Smart Crowd, a leading crowdsourcing company that partners with top businesses around the world. Most of the tasks are data entry related and users are typically paid per keystroke. That means if you’re a faster typer, you have the potential to earn more per hour. Sign up for Smart Crowd to start browsing thousands of online tasks. Like online surveys, companies will also pay you to test out new products before they launch, without requiring you to pay for those products. If you want to make some extra cash by using and testing new products, check out these top sites. While National Consumer Panel is a leading survey company, many people don’t realize that there are also opportunities to test products and provide feedback before those products hit the market. Powered by Nielsen, National Consumer Panel rewards users for scanning their purchases in-store and sharing shopping data. These rewards are in the form of cash, gift cards, and various prizes. To become part of National Consumer Panel, click here. Influenster is a worldwide database of real user reviews on products and services that we use every day. Active users will have the chance to receive a voxbox, which is a box of free products to test and review on the site. The more active and engaged you are on the site, the higher the chances of receiving one of these boxes. Check out Influenster and sign up today to contribute. Swaggable connects with hundreds of brands to help market and promote products and services. Part of that promotion includes providing free samples to Swaggable users. The users get to receive products for free, test them, and provide their honest reviews, making it a win for the user and a win for the business gathering valuable consumer data. Get your free swag by signing up for Swaggable today. Another popular survey site, American Consumer Opinion is also a leading product testing site, allowing users to test new products, advertising, and packaging before it hits the market. When you sign up for American Consumer Opinion, you can browse the various product testing offers that match your interests. Test out new products before they’re released through American Consumer Opinion. If you spend time during your day checking your emails, you can sign up for the following sites to receive money for simply checking your email throughout the day. Aside from the various surveys and video tasks that FusionCash pays you to complete, you can also have targeted emails sent right to your inbox. When you read an email and interact with it, you’ll be paid. While the payment per email is relatively low, it’s a great way to passively earn money just by checking your email. Sign up for paid emails on FusionCash today. Just like FusionCash, CashCrate pays you for surveys, questionnaires, watching videos, interacting with ads, and reading your email. You can sign up for regular paid emails that earn you a small amount of cash with every interaction. Check out CashCrate to get started. Cash4Offers specializes in paid emails, offering users paid emails almost daily from partner companies. It takes just a few seconds to read and interact with the email, making it an incredibly simple way to earn cash doing things you’re already doing online. Start making money checking your email by signing up for Cash4Offers. Another site that pays you for simply reading your email is InboxPays, an industry-leader in paid email advertisements. Just like the sites before, you simply need to sign up for a free InboxPays account to start receiving your paid emails right in your inbox. Still need more ways to make money for doing the things you’re doing already? You don’t have to be a professional writer to make money blogging. Whether you set up your own blog and work with affiliate programs, or are paid to write for other websites, you can make significant money just by blogging. Sites like Upwork and Freelancer are great for new writers. Also, you can always connect with websites directly to see if they have any paid writing opportunities. There are many sites out there designated to running contests and sweepstakes, some offering prizes including cash, cars, electronics, and vacations. Signing up for contests doesn’t take more than a few minutes. With sites such as Online-Sweepstakes offering hundreds of lucrative sweepstakes, you can win amazing prizes just by entering your information. With Drop, you can turn everyday purchases into fun cash rewards. Link your credit and debit cards, do your regular shopping, and you’ll be rewarded with cash back and other rewards right in the Drop app. Turn your shopping into rewards by signing up for Drop today. Flipgive is a team-based application that rewards users with cash back, discounts, and other rewards for the shopping you and your team are doing every day. The site is a targeted fundraising site that helps teams and organizations raise money by shopping, completing activities, and accepting donations through the Flipgive portal. Use Flipgive to get rewards for your team’s shopping. If you’re an avid photographer, you can turn your photos into extra income by uploading your photos to popular stock photo sites such as Shutterstock and Fotolia. Simply register for a free account, review posting requirements, and upload your photos. Keep in mind that some sites don’t allow you to post your photo on multiple stock photo sites. You’ll get a portion of every sale and don’t need to do anything more than upload your photo online. Ellevest is a leading robo-management site that manages investment portfolios and delivers impressive returns. Designed with women in mind, you can make money on Ellevest when you move your retirement and other investment accounts over to the site. Take advantage of expert guidance and cutting-edge artificial intelligence through your investment portfolio. Turn your creative eye into side income by selling your web and graphic design skills. With thousands of websites and publications uploaded every day, companies and individuals are willing to pay for high-quality designs from skilled graphic artists. Check out Fiverr and similar sites to connect with potential clients willing to pay for your work. If you love pets, as most of us do, you can make money and get to hang out with animals all day. Sites like Wag and Rover allow you to set your own schedule and prices and easily connect with pet owners in your area. Walk dogs, watch pets in the owners’ homes, or even have pets stay in your home overnight, all while getting paid. Companies are quickly realizing the power of social media, so if you’re skilled at social media marketing, you can be paid for your skills. The ability to create social media ads and engage with users is a highly sought after skill, and you can connect with companies in need on sites like LinkedIn. We browse the web every day, and you can get paid to test out some of the sites that are used by millions of people around the world. Sites like uTest and Analysia pay users to record their thoughts about websites, and run through a series of actions to test the interface and back-end of websites. Need even more ways to earn? Check out 112 ways to make money online. Have you used any of these methods or do you have more ways to get free money online?